With over 30 years performing experience, Bill Nuvo of Nuvo Entertainment is a well-rounded performer. Adding other performing arts to his shows, he has created a unique experience. Not only will you experience magic and illusion but puppetry, balloon artistry, juggling, balancing feats and more! For more information, please see the Nuvo Entertainment website. Toronto born Illusionist Coby has taken magic to new levels and heights. Striving to be unique as well as entertaining, he has a different perspective of what magic and illusions should be, and how to create the sense of wonder in his shows. “There are a lot of things that come into play in what it is that I do. it’s the lighting, the music, and the magic of course, and how they have to congeal somehow into a final product. It can take anywhere from six weeks to six months to come up with an entire illusion. I get my highs off making people doubt Mother Nature”, says the intense performer. To him it’s not about the actual “trick”, it’s about taking the audience on a journey and making them feel that anything is possible. In the corporate world COBY has made some of the most prominent people appear on stage. He always customizes, his performance to suit his venues. He has also taught the art of magic to some of the biggest names in entertainment. His personal lessons have also helped aid many individuals open the ice and close some major deals and projects. He also has acted as a consulting aid to the Toronto Metropolitan Police, teaching them the art of magic, deception and misdirection. Coby is more than a magician: He is first of all a perfect creator. He writes, develops, and carries all of his projects himself. He is a master showman in both close up, and grand illusion. “From week to week we work on the development of a new illusion and test it. That keeps me on my toes, and provides the show with certain freshness. Quite a few people attend my shows several times but we still manage to surprise them by challenging the show or adding a new element.” Coby is currently working on an escape from the top of Toronto's CN Tower-The tallest freestanding structure in the world! -Stay tuned. Coby has lifted the meaning of magic to new dimensions. He created new understanding for what the word magic describes and what it will also mean in the future, He has re-written the book and has led magic to unsuspected heights of art and imagination which neither the magicians nor the public could ever have envisioned in the past. He refined the old art of magic to a kind of high tech magic. His illusions are both spectacular magic and entertaining theatre. He combines mystery and romance in a sensuous experience for eye and ear, body and soul – in absolutely incredible illusions, which rock our senses and move our hearts. Coby changes our view of what magic is and what it can be for all times. Coby is one of Toronto Canada's foremost magicians. Hilarious, bumbling-fumbling comedy, dazzling magic and loads of audience participation! 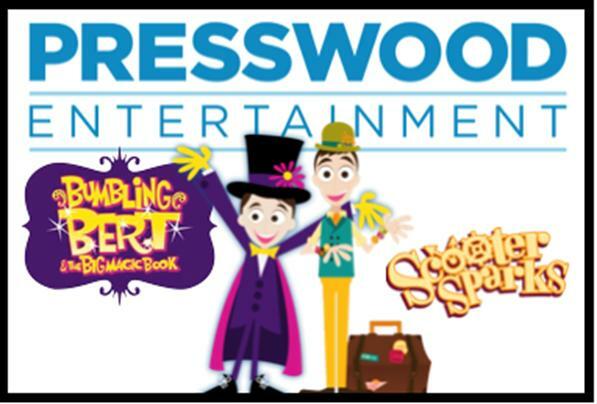 Visit www.presswood.com for more information. Magician and Illusionist Sam Pearce has entertained thousands of families across the nation. From large scale theatre productions to high-profile corporate entertainment, Sam has the knowledge and experience to make your next event memorable. Theatres, charities and Fortune 500 companies across Canada have trusted Sam year after year to provide them with stunning, clean entertainment for their high-profile events. Sam's outstanding list of thrilled clients includes: Television Ontario, Scotiabank, Imperial Oil Ltd., Suncor Energy Inc., Fanshawe TV, Maple Leaf Foods Inc., SickKids Foundation, Bruce Power, AMEC ncl, Direct Energy, Canadian Red Cross and many, many more. I perform a unique blend of Sleight of Hand, Comedy, Grand Illusion and Audience Participation. Whether it is on television or on the stage in the United States, Bahamas, Bermuda, Japan or Canada, this Dynamic Performer always leaves the audience asking for more. Providing Refreshing, Tastefully Hilarious, Live Entertainment Solutions to Enhance Your Next Special Event! Mark Baluk has been performing all over Ontario. You may have seen him do a show around town or even on TV! Either way, be prepared for lots of fun! Through countless astounding performances and competitions, Mark has gained the knowledge to perform with his funny and amazing stage presence for your next event. Dan Trommater is a professional magician in Toronto who offers a variety of sophisticated styles of magic to clients across the continent. Guests will remember your event long after it's over with the addition of Dan's incredible magic. Dan's performances are geared toward intelligent adults, yet are family-friendly. Most importantly, Dan fashions these incredible moments without embarrassing your guests or making anyone feel foolish. "My sole purpose when performing magic is to make sure everyone has a great time. In the words of the 20th-century master Nate Leipzig, “People don't mind being fooled as long as they are fooled by a gentleman.” In order to do my job as a magician, I must deceive the audience. But I insist on doing it in a way that takes the ‘sting’ out of it. That’s why I treat my audiences with the utmost respect and put the focus on the fun, not the fooling." Visit www.TheTorontoMagician.com for lots more information, including video of Dan in action! Incredibrent is Toronto's Birthday Magician! Serving the Greater Toronto Area and beyond Incredibrent's Magic & Comedy shows can be seen at Birthday Parties, Special Events, Festivals, Resorts, School Assemblies and much more! Incredibrent's shows are fast paced, funny, fully interactive and contain some truly amazing magic! Visit Brent's website to view his promotional video or call him today at (647)-453-3278. Born in Ottawa in August of 1974, Magicalaurie has had a lifelong love for performance. She is a Theatre-Arts Honours Graduate, with a broad base of Theatre skills, including writing and directing and will customize a performance to suit its venue. Wayne Tellier does great festival performances, to the Awww, and wonder of his all ages audience. He also amazes in any Close Up environment. Simply put,....see if Wayne can make your next event,.....MAGICAL! You’ve witnessed him astonish millions of viewers live on MTV. Featured on Showcases’ hit show Kenny vs. Spenny. Perform unbelievable feats on ‘Mornings with Mad Dog & Billy’ (Virgin Radio 99.9). Even experienced him live on stage at one of his countless sold out performances! Mysterion is easily recognized as one of Canada’s leading psychic entertainers! Providing unique entertainment options for your next event! Imagine your guests participating in a mind reading show where they become the stars. Metal bend in their hands, their thoughts are revealed and their choices predicted! Humorous, mystifying entertainment for all audiences. Windsor Wizard, Johnny Ould - 'Jonathon T. Wizard' entertains Windsor Ontario area Children and their Families! Shows Featuring 'JONATHON T. WIZARD' Cause Excitability in Young Children. This popular Children's & Family Entertainer arrives ready to perform his unique entertaining magic routines right before your very eyes. Perfect Unforgettable Entertainment for Children's Birthday Parties and Family Events! Windsor Ontario clients, please call 519-944-9424 for full details or visit our website for more information and lots of Magic Fun Freebies! Toronto Magician Andy Blau - is a classically skilled magician with a New York street-hustler style and slick twist of con-man attitude. For the last 20 years he's performed all over North America, and at just about every venue including Night-clubs, outdoor events, and theme parks, and a vast array of private shows including trade shows, corporate events, weddings, and dinner parties. The show ranges from family-friendly to adult nightclub, and is scalable and adaptable to almost any venue. Did I mention that his mother thinks he's pretty good? favourite of children and adults alike. His special blend of magic and humour have taken him across North America to such major centres as Ontario’s Muskoka region, Windsor, London, Kitchener, Toronto, Atlantic Canada, Detroit, Los Angeles, and New York City, where he has produced and starred in shows in theme parks, resorts, shopping centres, theatres and casinos. He is also a popular guest at fairs, festivals and exhibitions. Evans & Evans Magic and Comedy provide the highest quality entertainment for any event, from the moment you contact us, we work with you to create the best entertainment experience possible for your needs. For every show, each routine, each trick, each illusion and the patter, is chosen for that specific audience and venue to deliver the most appropriate and entertaining performance for your satisfaction. The success of this formula can be seen in the positive comments we receive from clients and audience members as well as the repeat bookings. "That was the most entertaining magic show I have ever seen"
"Evans & Evans delivered an excellent show at our Annual Business Awards Ceremony that was thoroughly enjoyed by the audience"
"We'd like to book you to come back and perform at our Canada Day Celebrations again for next year"
For years Daniel has been captivating audiences of all ages and sizes throughout Ontario. 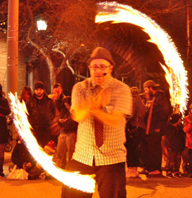 From small family gatherings to large fairs, festivals, and theatres Daniel does it all! Daniel can accommodate his show for any size of audience and any size of venue. With his clean humour and personal charm Daniel can keep any type of audience on the edge of their seat using a unique blend of comedy, music and grand illusion. Book Daniel Steep today before your date disappears! MAGIC is an art, it has been around for thousands of years, it continues to mystify, entertain and thrill audiences everywhere. Many years ago Edward Stone had the privilege to meet the famous Mr. Doug Henning, and from that point on Magic has ran through his veins. Through his unique blend of Magic, Illusions, and humour, Edward Stone will make your next event unforgettable. The show features Las Vegas style Illusions and can be customised to your event, corporate, stage, family, whatever your needs. Edward Stone performs in central Ontario, Canada and Western N.Y., U.S.A.
By combining Magic with audience interaction, Mike delivers a unique experience tailored to your company's needs. With many years experience as a professional magician, Mike offers what clients expect: Talent, Versatility and Great Value. Magic Mike Segal is a BFA (Theatre Performance Major) graduate; a member of Britain’s Magic Circle, The International Brotherhood Of Magicians, The Canadian Association of Magicians and The Society Of American Magicians. Please visit the website for more details. Internationally known award-winning magic comedian Peter Marucci has been performing in Canada and the U.S. since 1957, for adults and children, at private parties, clubs, restaurants, h=church and service groups, sales promotions, conventions, and trade shows. He has performed for groups as small as three to as large as three thousand. 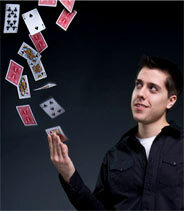 Zachary Gauthier is an accomplished young performer who loves to thrill and amaze with his magic. Whether the occasion is a small birthday party, fundraiser or larger special event Zachary takes great pride in designing a show that will appeal to children and audiences of all ages and sizes! Classic magic for young and old for more than thirty years . Adult or children's shows tailored to fit your event. Classic magic performed in the vaudeville era style. Hypnotism and Esp that will delight and amaze audiences young and old. To see the video on youtube, please click here. Canada's Master of Psychological Illusion and Mentalism. An experienced professional who has performed in 31 countries world-wide, Thomas Baxter offers a unique mystery entertainment that he calls ThoughtControl. Imagine an audience engaged in a wondrous experience. THAT is ThoughtControl. Thomas Baxter does not pretend to be psychic, and what he does is not hypnosis, but he will manipulate your perceptions, direct your behavior and (gulp)control your thoughts in a one-man show that The National Post called "Truly Amazing! I was enraptured!". At The Antigonish Performing Arts, critics said: "Baxter may be an illusionist, but more than this, he is a sage who is able to raise the consciousness of his audience to experience the connection between people." Baxter's ThoughtControl is a motivational, mystery -filled, hilariously entertaining show that proves that we really are all connected in the most wonderful and unusual ways! Magical Entertainer Vincent is an Excellent Professional Magician and Multi-Talented Performer! He does Amazing Magic Shows for Birthdays, Stage and Close-up Strolling Magic for Audiences of All Ages and Sizes! Jake is a young and talented performer. With 3 years performing experience, and 9 years in magic. At 16 Jake has performed for clients such as Schneiders, United Way, WAMBO and more! 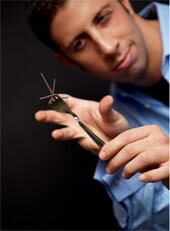 Jake specializes in Close-Up Magic and Mentalism. Along with Stage magic. Jake brings everything needed at any occasion, all you have to do is sit back, relax, and let Jake handle the guests. Entertaining thousands at a time. Jake is not your top hat, tailed tuxedo magician you think of. With Jake you witness nothing but pure close-up miracles and wonderful entertainment. Whether it be cards, coins, sponge's, ropes or even fire, there is no doubt you will be getting an incredible experience that will stay with you for your entire life. I am relative beginner in magic, with only a few years experience, but I still offer a custom show designed to meet your needs. The routine is usually based around card magic but I will usually throw in a few other things to mix it up. I am currently preparing a fork bending routine as well. My name is Braham and I’m doing magic job for about 15 years and for about 5 years I’m doing my job professional I like dove and ball tricks I’m a member of IBM and SAM and 15 other country magician association. Performing for over 20 years, Ryan wilson is available for all events, weddings, picnics, corporate get together, and strolling walk around magic, with a speciality in kids show magic and entertainment. No venue is to big or too small. Ryan performs in Toronto, and Surrounding GTA area - Mississauga, Oakville, Brampton, Richmondhill, Markham. The Poynters - Duo of Deception, Couple of Comedy. Ken and Barbi specialize in Corporate Entertainment. Comedy, Illusions, Stage Magic, Walk-About & Pick-Pocket. Performed for Cruise Lines, Theatres, Television, Fairs and Corporate Events and Trade Shows. Xtreme Magic Entertainment- Professional magician Justin Govan Has been performing magic professionally for 10 years. Justin performs astonishing close up magic for any event. Justin provides elegant close up magic for Private parties, Stag and doe's, weddings, corporate events, etc. Amaze you're guests with professional close up magic at you're next event. Please visit the website for more information. Toronto Based Magician Bobby Motta. From a Family of Magicians Performing Magic for Years in The Toronto Area & GTA. Canada's First Family of Magic. Ken, Barbi, Aria & Dallas will entertain the very youngest to the very oldest in your audience. Magic, Comedy, Music, Illusion & Audience participation. Theatres, Resorts, CNE, Fairs, Television and corporate events. Toronto, Ontario, Canada, North America. Comedy magician and juggler Steve Seguin provides sophisticated entertainment for conferences, banquets, and other corporate events. Based in London, Ontario but performs throughout North America. Corporate Illusionist Timothy Drake specializes in special events entertainment for corporate functions across Canada. Entertaining one man magic show for all ages, birthday parties, company parties, banquets, conventions, fundraisers, schools, grand openings, fairs, picnics, daycares, restaurants & carnivals. I have performed mainly in Toronto & GTA. Most recently London England, New York & California. I am The Party Magician and for almost 20 years I have been performing magic professionally at family events all over Ontario – festivals, fairs, company picnics and yes, birthday parties! When you book The Party Magician you get a seasoned professional with a performing bio that goes back more than 40 years. That means you get entertainment; by an entertainer that understands the family audience. Your guests, whatever their age, will go home with big smiles, amazed looks and happy memories. And with over 35 years in the corporate world you can be assured of engaging and intellectually stimulating entertainment for all types of business functions - sales meetings, conferences, banquets, board room diversions. Over the years, Jasveen has developed a somewhat awkward habit of baffling reporters by revealing their bank PIN numbers on camera. From the streets of Singapore to some of the swankiest penthouses and lounges in Toronto, Jasveen has been offering his clients a very unique form of entertainment. Using a mixture of magic, mentalism and hypnosis, he presents an assortment of mysteries that has left audiences around the world spellbound. Make your next event a memorable one! As seen as on national television! What makes a moment truly “magical”? For Brad Toulouse, it is a point in time when a person is transported, even if only for a fleeting moment, back to a place where the wonder and fantasy of childhood still exists, when anything and everything is possible! The Amazing Edwardo has performed on on late night with David Letterman, Carnival Cruise ships, Governor General of Canada, on National TV on Canada Day, and holds a world record for entertainment. You may have read about him in several National Newspapers about his non-profit Community Cabaret Theatre he created where he impersonates over 50 famous people in this one of a kind variety show for the last 4 years including Magic, escape tribute to Houdini and juggling. Check out his video website for more info.